they are as happy as can be. i must confess to several thoughts. 1. do dogs feel the weight of Mr Gloom? 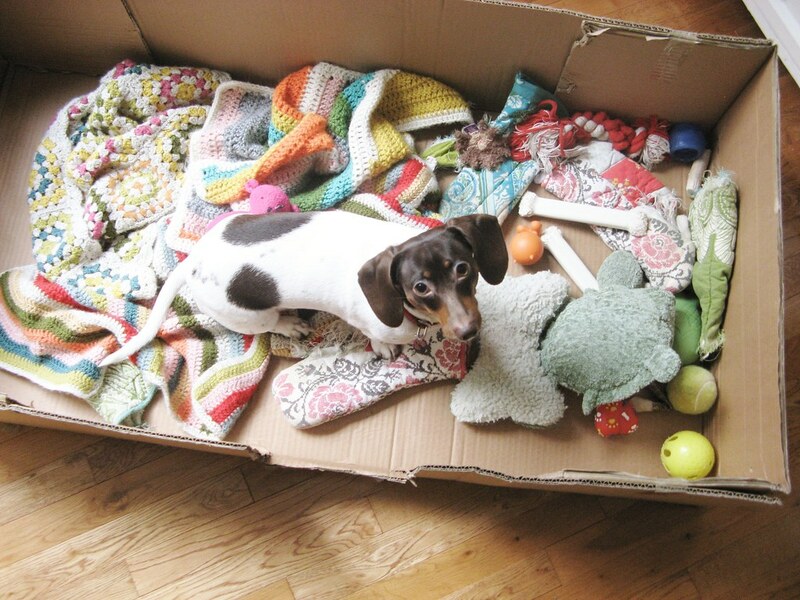 2. i am slightly envious of little olive and her box. 3. have i completely lost my teeny tiny mind, standing here at 11am taking photos of a little doggie in a cardboard box, with her many blankets and mangled oven mitts, whilst feeling slightly envious. She is so precious. I love it when Olive makes an appearance. And just so you might feel better...my guilty photographic pleasure is taking pictures of my sleeping children. They are just so darn angelic in that state. My sister says I am a little nuts (but then again, she learned that about me long before I had any children to help). Olive is most adorable in her lovely cardboard box. I'm sure my Miss Molly would love to meet her, and perhaps romp around with her. I am also envious. It seems like a good day for a cardboard box. Stop it! I can't take any more cuteness. gosh she is so gorgeous! there are days when I would love to crawl into a carboard box with a blanket over my head! 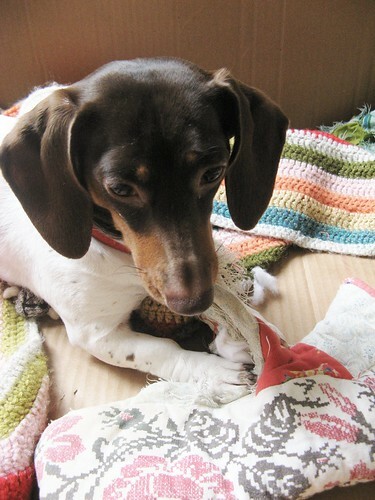 OLIVE IS ADORABLE AND HER PLAY PEN IS WONDERFUL - I SEE SHE HAS A GORGEOUS BLANKIE! She's a cutie pie dog...you could do worse than wanting to be like her. Love your Olive ....made your paper hearts yesterday....they are so simple and sweet...I will definitely be making many more...thanks for the inspiration!! Little Olive is just so cute! 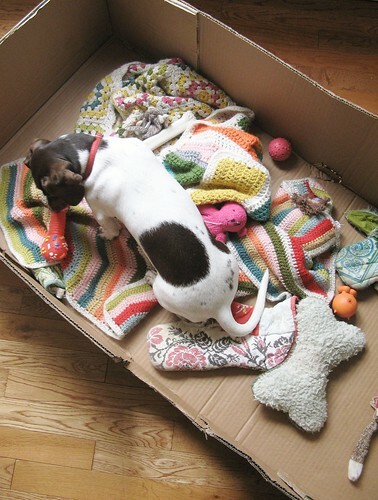 Her little box is just the job and her lovely collection of blankets and oven gloves is just sweet! What is it with dogs and oven gloves? Mine jumps up to pull them down from the oven handle and takes them to bed with her!!!! it seems Mr. Gloom has moved right in. I hope you are feeling better soon. Do something completely different to shake him off, perhaps? I've been feeling out of sorts lately too. I think I need a fresh, new project! And, to give myself the luxury of lots of time to enjoy it. p.s. my captcha code is "direary' how ironic. wow, little olive has some very pretty toys! and no, you have not lost your mind, i share your envy! what pretty colours fill her box as well! i would be envious, imagine being content and happy with a little bx and wworn oven mitts! not having to worry about everyone else or work or school. What a little cutie! I love all of her little crocheted blankies too. Haha, yes Id be questioning myself also,I too feel a little envious. She looks so cosy safe and loved. hahaha- so funny! I love Olive - she is so cute! Oh Dottie, I fear I understand to well. Just today I was thinking of how overwhelmed I feel, of nothing in particular. I have been sewing and crafting for days, while my Mr. B. is abroad. The kitchen is full of all kinds of good things in various stages of done or wanting to be done. My house needs a good de-cluttering and cleaning, but somehow I do not know where to begin. This is so unlike me. My Mom says it is the "change". A scary thought because I do not want to "change". I want to be my normal "handle six things at once" self. So, see you are not alone, and I think it will pass. You are an inspiration to many. Besides, little Olive is adorable in her little box and is deserving of all the attention. My dog Mr. Darcy has been a good companion and I think I will go and take his picture, I love him so! Mister Gloom sure is keeping our minds occupied isn't he? I live out there in Carnation and boy is it rough. remedy is a cardboard box filled with soft hings that smell like comfort and a loving mother who takes endless snaps of them. he looks happier on it. Aw, sweet girl. That box looks like a fun place to be. she is just so adorable!! 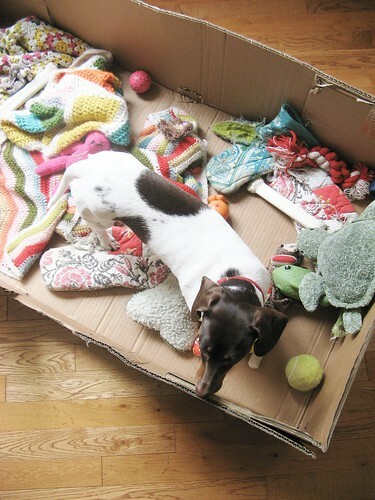 Oh my, Olive is just so cute, and she looks as pleased as pie in her box : ) I would like to have a play box, few blankets and a glass wine and I would be pleased as pie too. Need to ask, but would it be okay for me to draw Olive (Im an artist)? I LOVE her bedding.. so cute! the moral of your cardboard box story....man or beast is always happiest when given the simplest supplies with which to work....that little olive is my kinda gal. so happy to have a computer again...i've missed your dottie ways. So sweet. Love your post and Olive is to love. I've never been jealous of a dog, but I sure wish I had such great blankets to snuggle up in! I went to Costco the other day and my purchase was put in a similar box but i had to cut a little easier doorway for my weenie dog to get in it. She has her special pillow her auntie made her and her little heating blanket in it and just loves it. 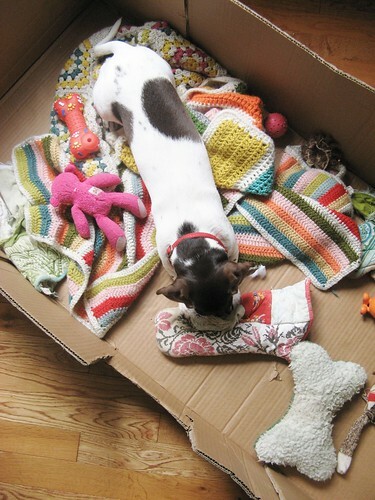 Little Olive, certainly has good taste in choosing blankets for her cardboard box Tif. If you are feeling the weight of Mr Gloom, pop over for a visit. We have lots of blue sky and sunshine in this corner of the globe. Guaranteed to send Mr. Gloom and his gloomy ways packing. little olive looks so sweet! Did she steal the oven gloves or was she given them? OMG, Olive is gorgeous!! What breed is she? We have two little Jack Russells, both with really, really short legs so they too would need the health and safety measures so carefully undertaken by your #4 for little Olive!! I don't think you have lost your mind....little Olives nest looks a fun and lovely place for a nap......but really you have a book to write so less dilly dawdling please, and get back to the computor! Home sweet home, even if it's made of cardboard ! I'm quite envying my own dog's ability to sleep through the day on the sofa that he's managed to sneak his way through to whilst I toil in an office to buy him the finest of snacks. If he could just type, I'd be trading places right now. Birds of a feather, then? She is still the sweetest dog I've seen in some time, I love it when you put on pics of her. Give her a cuddle from me. just gorgeous. taking photos of pups this cute is a given! Sweet little Olive she has a wonderful cosy little hidey home. Wishing you a peachy weekend at home in the shed without Mr. Gloom. No no you have not lost your mind. If so I certainly have as well. Those photographs are so precious and her name Olive... I almost got teary. That kind of oh my gosh she is too precious in her little box. What a sweet little girl and a lucky one at that. All the colors and patterns for her to enjoy. Big kiss for Olive from me. we are all barking mad, however little Olive is sooooooo beautiful. Love the oven mitts. Like you, she's made herself a lovely and inviting nest. Yes, having two distantly-related-to-Olive creatures in my own household, they do have their moods! Happy days seem to start with a distinctly "jaunty trot" outside. Life can only get better when there are birds and wind-driven leaves to bark at. Actually, anything to bark at. But I have witnessed the bird gangs in our neighborhood deliberately taunting Cooper and Sebastian. The leaves seem rather indifferent. The puppies have decided that my 'ordinarily extraordinary blanket' is theirs. Humpf. YES! the oven mitts are so funny. Everyone needs a tiny little safe spot! Right again, DOttie Angel. Very cute! I have a little Shi-poo puppy with the same name. We love our little Olive, too! By the way, I'm enjoying reading your blog- very creative writing and inspiring projects. Thank you! I could sit and watch sweet olive for days! she looks very content. it's probably reassuring to think your world is so small as to fit into a cardboard box. quite manageable in fact. 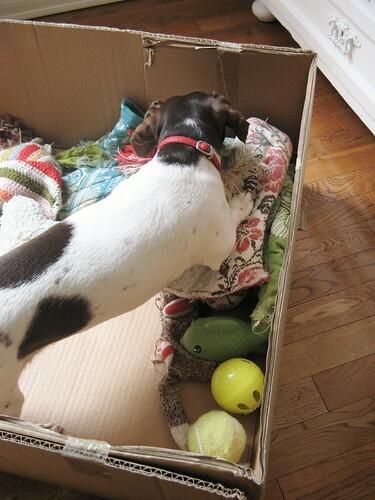 (dare I say that she appears quite spoiled with an abundance of toys and snugglies). Oh for the simple life where the only choices were whether to chew on the oven mitt or curl up on the blanky - I'm envious too! I too have been moved lately from my normal colours - normal being 'all rainbow colours together' to the calmness and sereneness that is white and cream and grey. I am struggling as other colours want to pop in! I am loving your clean white brightness. 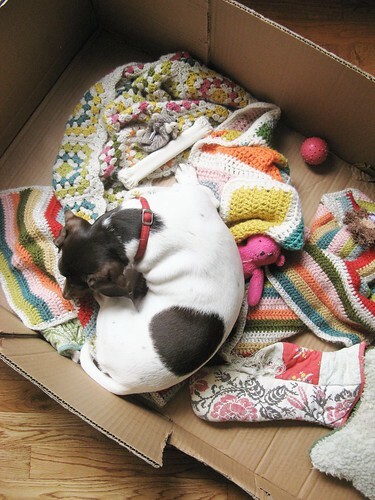 I am envious of little olive's cosy space, maybe we all need a space like that?! Olive is sooooo sweet. How old is she? Your puppy is adorable and I'm sure you are in awe of her cuteness hense the lingering. I think dogs are generally really happy and sometimes bored (that's when they get into you know what) but always so happy to greet you even if you just went out to get the mail. Love pups! no you haven't....it's good for us to love our doggies! Sometimes it would feel good to have a little nest like this with my favorite, simple things-handmade with love (I remember you making Olive the blankie!) and having all the good smells of cooking, love, and warmth. Olive is one lucky doggie-I think I'll go curl up on my couch with one of my favorite quilts and snuggle in with a pillow and a good book. Might end up feeling as good as Olive! Hope Mr. Gloom doesn't stick around for you-go cuddle!!! That is one spoiled dog! Mind you, as I type, my pooch is snuggled up on the sofa, having her afternoon snooze. Coming from someone who is permanently looking for photo ops of my furry kid, I think you can never take too many pics of such a cute pooch. Adorable! 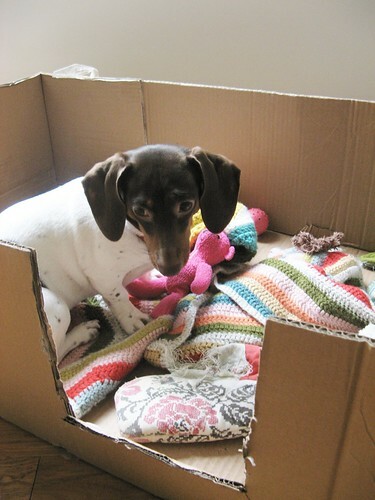 dearest readers, you are so kind with your lovely words for me, little olive and her cardboard box! i knew i was not alone with my barking mad ways... actually i had to make myself a cup of tea as you had so many lovely things to write, what a grand start to my sunday indeed! The cute radar is gone off the map with this little pupstermatic! look at her with her designer toys. I want that blanket! I need to thank myself for discovering your blog! I don't think you're crazy for being envious of Olive and her box, I am envious too (unless, of course, that means we are both crazy?!). Just look at those gorgeous blankets....so soft and colourful and snuggly. Who, in their right mind, wouldn't be envious?! !